The middle of July has turned out wet. 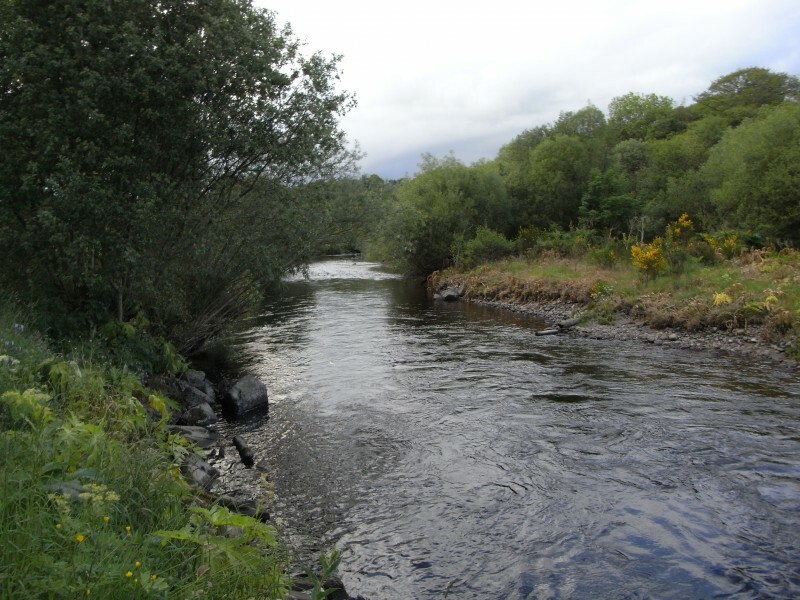 With two spates in the last five days there has been ample water for salmon, grilse and sea trout to move through the river system, which is exactly what has happened. 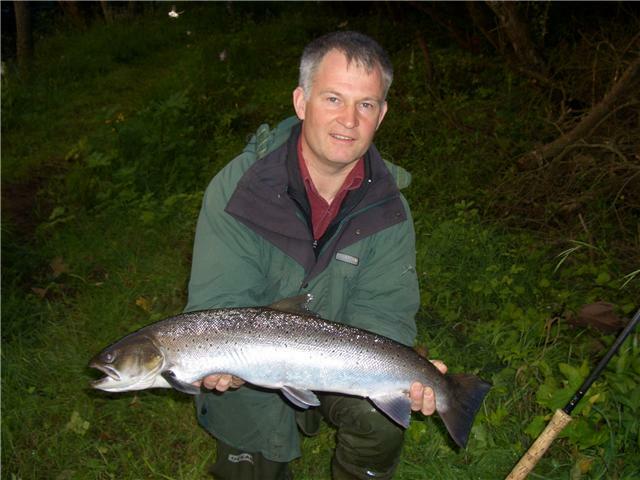 On Friday Andrew Robertson hooked and lost a very large salmon in The Bridge Pool. He played the fish for more than twenty minutes and described it as sea-fresh with a tail breadth of at least 9″ tip to tip of the tail fin. Then, also on Friday, Derek Strachan caught and returned a beautiful sea trout of 30″ in length and an estimated weight of 7.5lbs to 8lbs. From scale readings we learned that this female sea trout is (still alive and on its way to spawning!) is nine years old having smolted after two years in the river and spent one year at sea before returning to spawn in each of the last seven years. The picture below shows Derek with the fish just before returning it to the river. Since then, with the level of the river up and down with heavy showers in the hills, and the water too peaty for optimum fly fishing, we have caught two grilse, one nice one of 7.5lbs – his first salmon – by Simon Walter and half a dozen sea trout. Needless to say there was much rejoicing and a celebratory dram or two because Simon is the designer and maintainer of this website, which many of our readers tell us they enjoy. I caught a small grilse early on Monday in Tyndals, but on Tuesday no less than three salmon and seven sea trout were hooked and lost. I don’t find this particularly surprising because in my experience running fish in the South Esk tend to take the fly with less conviction than when they have settled into their lies in a falling river. As I write this on 21st July the river is roaring down in a brown spate after heavy rain throughout the night. We should see more grilse in the river after this spate, especially with the weekend lay-off of the coastal nets starting at 1800 on Friday. There are still a few days left in early August, so if you would like to rent a beat at Finavon, now is the time to contact us. I won’t say the rain amounted to very much: it didn’t. But it was enough to bring down a dirty little freshet to clear away the accumulated algae and debris that had collected along the gravel edges of our parched river during the nine weeks of drought. We had about a foot of water which produced enough of a rise in the level to reach the top of the Red Brae wall. Perhaps the odd dipper’s nest was drowned by the unexpected arrival of so much water after the long drought. Dr Martin Busk and his party from Kent arrived on Sunday and had five good sea trout on Monday, three of them during the day as the water dropped and cleared. On Tuesday the water dropped away all day long and now, on Wednesday morning, is back to low summer level. The difference between this week and last week, before the rain, is that the water temperature is lower, and the whole river is fresher and cleaner. More to the point, the pools, especially Indies and Willows, are holding good numbers of sea trout, some of which are in the 3lbs + category. Last night Moray and I fished Tyndals, Willows and Volcano, and between the two of us accounted for three sea trout, all between 2lbs and 3.5lbs. Conditions were great with a clear river, still with a touch of peat (about the colour of a ten-year-old Macallan) and plenty of fresh sea trout in these pools. Not much was showing, but when they took the fly they did so with enthusiasm and were all well hooked. During the day Martin Busk’s party had a 2.5 lbs sea trout in the middle of Marcus House Pool. In the first two days of this week we have caught 9 sea trout, none of which was under 2.5lbs and at least two of which were 4lbs or more. Good sea trout: just like the South Esk I knew 25 years ago! Reflecting on the season so far, it has been dominated by the low water of May and June, which put a full stop to the spring salmon fishing. But, encouraguingly, the sea trout have been running throughout the drought, usually in small ‘penny packet’ shoals, but nevertheless filling the major holding pools. As I write this on the 8th of July, we are seeing more sea trout than we have had at Finavon in early July for 5 or 6 years. Even more encouraging is the quality of these fish, which is generally excellent. We now await the arrival of the grilse. George Pullar, who owns the netting rights south of the South Esk estuary near Montrose, tells me that the grilse have arrived earlier than in the last few years and that they are bigger (4-7lbs) and in better condition. If we get more rain, and if another freshet coincides with the 3-day weekend ‘slap’ (lay-off) of the nets, then we should see grilse enter our pools, and make life really interesting! The last few days have been frustrating for anglers on the Finavon water, not least because we have heard of a superb week’s total (until Friday) of 57 sea trout, including a cracking sea trout of 8lbs, from Downie Park and Cortachy, against FCW’s 14 sea trout for the week so far. There are, I think, various factors at play here: first, it should be remembered that all the sea trout in the six or seven miles of water of Airlie Estates and Downie Park have passed through Finavon within the last couple of weeks. Also, there is of course more fishing water there than at Finavon. Then, fishing effort (and dare I mention it? expertise) has been much greater at Cortachy with a dedicated group of night fisherman fishing through the nights; finally, there is no doubt, since the ‘easing’ of the main obstructions on the river (Kinnaird, Kintrockat and Craigeassie Dams), that the passage of fish through the river to the upper reaches has become much easier. In some ways this can benefit Finavon, especially in the early spring. But, once the water temperature is up and there is enough water in the river to encourage fish to run, the main beneficiary is the upper river. In my view this is great for the South Esk because it disperses the stock throughout the catchment and gets the salmon and sea trout close to the spawning areas in good time.